I have long been against Disney’s current trend of reimagining their classic films for modern audiences. While they strike gold on occasion (Pete’s Dragon), more often then not, these films lack the spirit of their originals and grossly misrepresent their iconic characters (Maleficent). Therefore, it gives me immense pleasure to type that their newest film, Christopher Robin, not only understands the spirit of its characters and source material, but also places it in the modern world without succumbing to crude gags or pop culture references. If you loved Winnie The Pooh, then you will love this movie. Like Toy Story 3 (and I don’t make that comparison lightly), it is a love letter to those of us who grew up loving those characters as well as a logical conclusion to their story and a great introduction for today’s kids. As the trailers haven’t spoiled much of the plot, neither will I. The film follows a grown-up Christopher Robin (a perfectly cast Ewan McGregor), now an overworked and distant family man whose innocence was buried by the harshness of life. 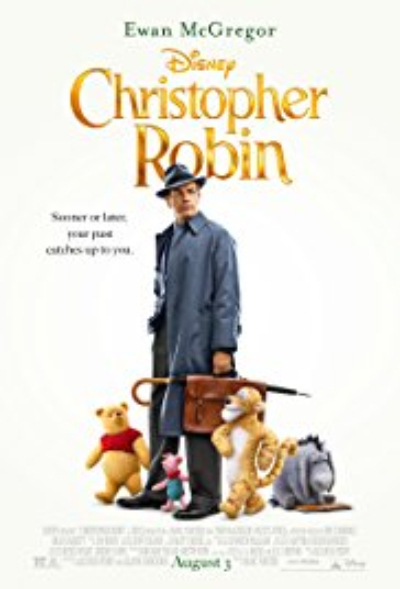 However, when his childhood friends Pooh, Tigger (both voiced by Jim Cummings), Eeyore (voiced by Brad Garrett), and Piglet (voiced by Nick Mohammed) reappear, Christopher will learn the value of embracing his inner child again. I love almost everything about this film. Pooh and his friends retain their personalities and blend seamlessly in the real world. The ever-reliable McGregor interacts perfectly with his cuddly co-stars, and the film’s score successfully combines bouncy and inviting pieces with surprisingly somber ones when needed. The voice acting is flawless on all sides, with Cummings and Garrett being true standouts as Tigger, Pooh, and Eeyore. The people working on this film clearly have reverence and love for these characters and they never talk down to or insult our intelligence. My only problem with the film is its lack of character development for Christopher at the start. We see him working at his job, but he’s hard to sympathize with for much of the first half. However, McGregor’s skill as an actor got me through this early rough period and was worth it in the end. Also, kids might need some explaining of the plot in the opening 20 minutes, but it’s simple enough to follow after that. Pooh and his friends lighten the mood and inject humor once they appear, so it’s well worth the wait. Christopher Robin is just the kind of hopeful family entertainment we need. It doesn’t shy away from sadness, but it’s not a depressing mess as some have proclaimed it. I would recommend this film to all family audiences and fans of these characters, if only so this silly old bear can remind us that this dark world still has some light in it. Rated PG For Some Action (a brief battle in WWII and some property damage).